Bill's OBX Beach Life: AWT Hatteras Wave Jam 2013 Here Next Week! 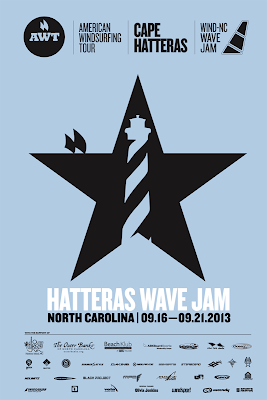 One week from today marks the start of the 2013 AWT Hatteras Wave Jam! The event focuses on windsurfing in the ocean surf (wavesailing) and will feature some of the best wavesailors in the world visiting Hatteras Island. PWA past wave champ, Kevin Pritchard, World Record Holder (longest wave ride on a windsurfer) Camille Juban, AWT woman's wave champ Ingrid Larouche, and others will be here visiting Hatteras to challenge our surf and wind conditions! The event centers in Avon and is sponsored locally be a number of windsurfing shops on Hatteras Island with Wind-NC as the title sponsor for the event. The Hatteras Wave Jam will include day time beach fun and competition along with evening parties, food, and drink hosted by various local windsurfing shop sponsors. The week long Jam will be one of the most happening weeks of the year on Hatteras Island and host some of the best high action windsurfers in the world!